Please refer to our stock # SJ0059 when inquiring. 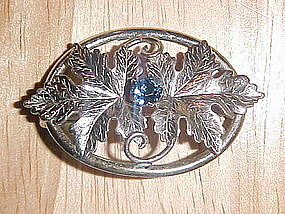 Nice vintage 1940's - 50's silver double maple leaf pin with a blue sapphire rhinestone center. This pin measures 1 11/16" wide x 1 1/16" high. The pin is signed " STERLING with the C A with arrow going through which is the signature for Carl Art." This pin is in very fine condition. The sapphire rhinestone has a couple of tiny flaws that can't be seen without a lense, but still sparkles! This pin would look great on a vintage hat.